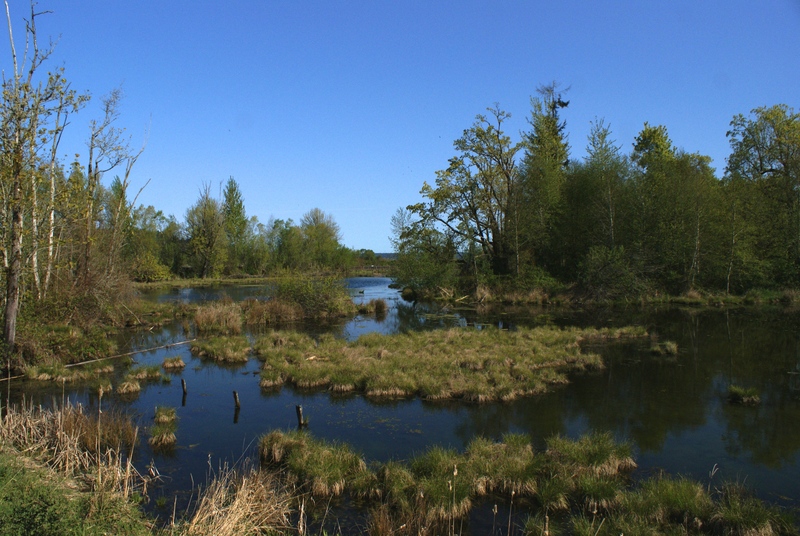 We recently spent a morning at the Nisqually Wildlife Refuge looking for birds. We did the boardwalk loop, and spent several hours just wandering along, stopping frequently to observe birds and other wildlife. Birds were wildly singing and very active all over. The sun was shining and it felt like spring in all the ways we think it should. 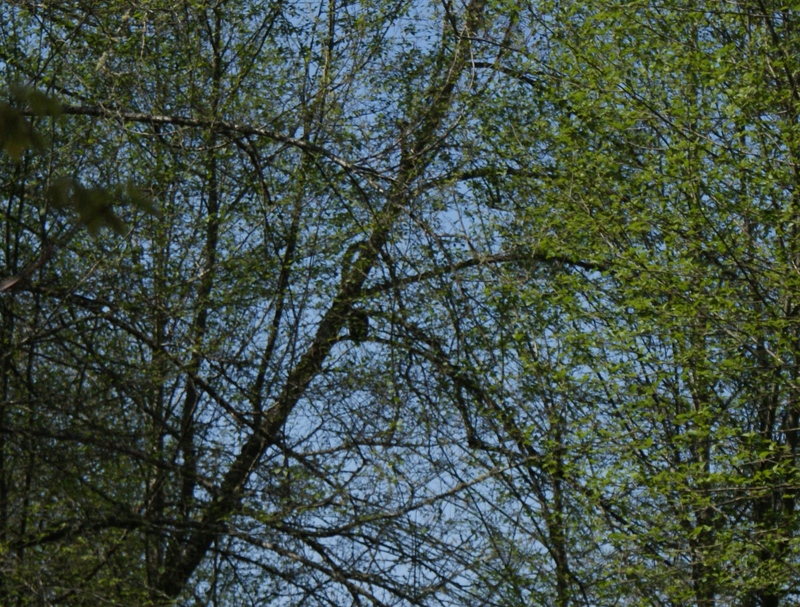 The first birds we noticed were the tree swallows, which were noisily swooping and chattering around every large big-leaf maple. 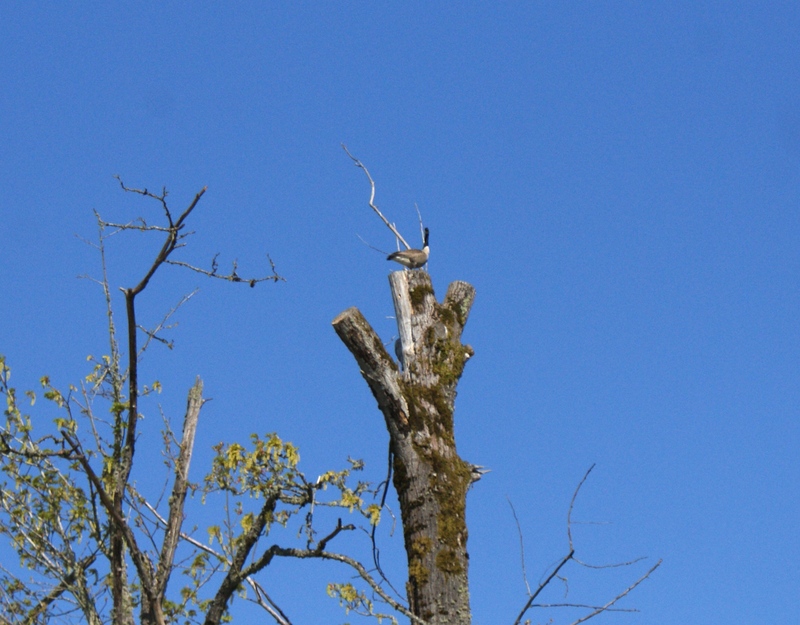 We were surprised by a Canada goose that had taken a post on the very top of a broken maple. 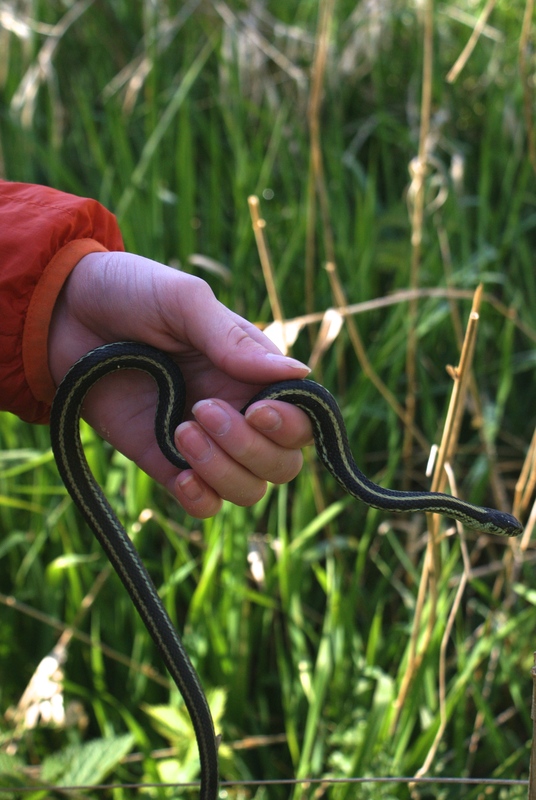 Gabe found a snake, which he was able to catch. Lately all the snakes he’s caught have peed on him. If you haven’t had the opportunity to smell that particular odor, it’s very strong and acrid. After we gently observed the snake, he ran back to the Visitor Center to wash up, but still had snake stench lingering the rest of the day. We learned the witchy-witchy-witchy song of the common yellowthroat. These delightful birds were singing loudly throughout the wetland area. Finally we were able to find one in a tree close to the trail, and watched it long enough to get a firm identity. It feels so satisfying to be able to make identifications like this on our own, and to connect the song with the bird. Every time I go birding I am reminded of just how very much I still have to learn. It is good for me to have a hobby like this that will continue to spur me on to learning and growth. There were many photographers and other birders on the trail, and one couple pointed out to us a rufous hummingbird nest. We could see the tiny jewel flying back and forth, and watch her putting the finishing touches on her nest. Later we caught up with the same couple on the other side of the wetland, and they pointed out another hummer on a nest. This one was feeding her babies! We would have never had the chance to see these fascinating scenes if they hadn’t take the time to patiently point them out to us. I’m thankful for the friendly folks who take the time to educate others. After pointing out the second hummer, the fellow showed us where to see the great-horned owl, as well. We were super happy to see it, as we missed the babies fledging this year. 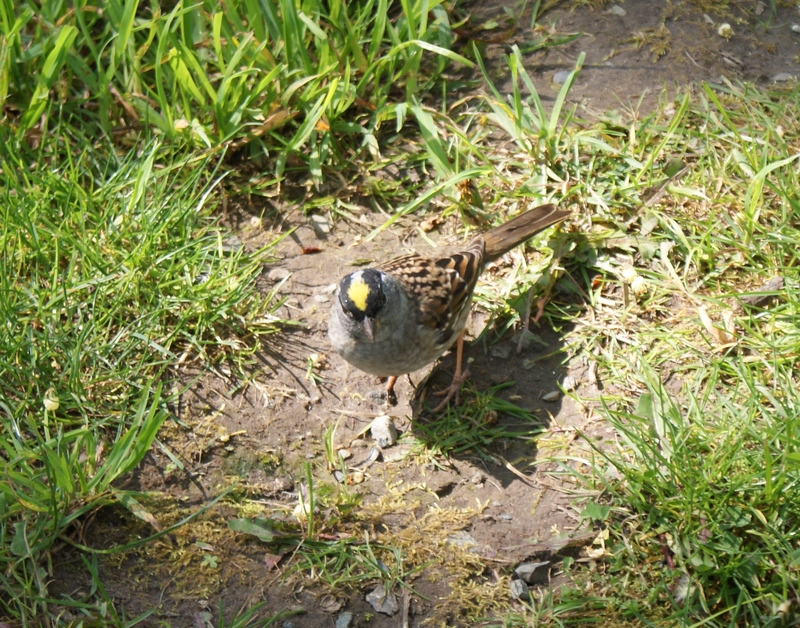 We ate lunch at the picnic tables, enjoying the swallows and the golden-crowned sparrows. We looked out from the observation platforms by the twin barns, but didn’t go out on the boardwalk this time. We saw abundant dark-skinned frogs in the wetlands (we weren’t sure what kind they were), but only one Pacific chorus frog. This wetland is a treasure, and we enjoyed our walk there again. We also spent a little time in the interpretive center, learning about the creatures that live in the mud flats. The kids begged me to buy them books and stuffed animals, but I resisted this time. They do have a great selection of books and gifts relating to various elements of the natural world. We noticed they had several programs and guided walks on the schedule, so that could be a great way for families to enjoy the Refuge. See this page for the details on visiting the Refuge.